The U.S. and China are intimately linked--for better or worse. Can we make room for each other? 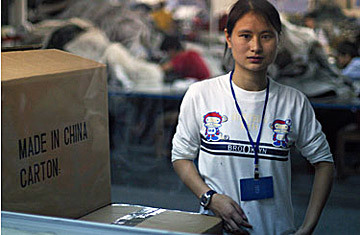 Liu Li works at a factory in Kaiping which produces clothing for the American company Timberland. The opposite of chaos is stability, and for the 16 years since the massacre near Tiananmen Square in 1989, China has enjoyed more stable leadership and prosperity than at any time in the past 150 years. Incomes have grown, and millions of lives--like that of Liu Li--have improved beyond imagination. To be sure, China is not one big, bucolic Iowa; all sorts of tensions over land use and workers' rights and free speech and endemic corruption and environmental despoliation loom, and they come into view in a startling number of riots and protests--big ones too. But compared with what China has been through in living memory, these are good times. Hu Jintao, the President and (a more important position) General Secretary of the Chinese Communist Party, wants to keep it that way. He came to power in November 2002 in the first political succession in modern China that took place without purges, late-night arrests or blood in the streets. That alone is a measure of China's new stability. The government's main focus: balancing growth between the go-go coastal areas and a sometimes shockingly poor interior, easing the movement of millions from farms to cities and ensuring that local officials do not succumb to corruption. So far, so good. But three years after Hu took power, the way in which he intends to secure stability has become apparent--and it is not what many foreign observers expected. Many hoped he would be a reformer, allowing alternative sources of power, like the media, regional governments, independent judges and prosecutors, to balance central control. As head of the party's school for top cadres from 1993 to 2002, he had encouraged the study of other societies going through profound dislocations. In power, however, Hu has come across as more of a communist traditionalist. Within the past six months, the party has started something of a crackdown on both traditional and new media. In speeches to the party faithful, Hu has said Western democracy is a "blind alley" for China, and he has excoriated the path to reform, with all its attendant chaos, taken in the Soviet Union by Mikhail Gorbachev. Hu's key policy initiative so far has been to strengthen, not weaken, the role of the Communist Party in Chinese life. "They believe the party is the only way that China can maintain political stability," says a China watcher in the U.S. government. "Political institutions outside the party are not to be trusted." In essence, the thinking goes, party discipline guarantees stability, which in turn breeds national strength. The great question now is whether internal pressures or external forces will somehow throw China's rise off course. Outside its borders, the new China has plenty of friends. How could it not? Its growing markets and voracious appetite for the world's goods are making companies and their workers wealthy, from Latin American cattle ranchers to French vineyards. In the U.S., the ever increasing flood of low-priced Chinese products has enabled rising standards of living for years (even as it has made job security in some areas more tenuous).